Here's the first race update of the summer, plus a great offer to MMBCC members from Cycling Inform and the Wangaratta CC calendar. Don't forget to subscribe to the newsletter emails! The podium from L to R: 4th Tom Kelly, 2nd Dan Purcell, 1st Zac Empey, 3rd Lee Noble and 5th Tom Hogan. A great first night of Dirt Crits saw 22 line up for the ICU-UCMe race consisting of a mass-start first lap to set handicaps; then a second lap based on those handicaps. First back on the first lap was Tom Macmunn followed by Bob Thomas and Lee Noble. The second lap saw Finn Baker head out first, followed by Zac Empey and Ruby Dobson; Tom Macmunn was last to start. Zac was first back to take a clear win. However, the rest of the podium was very close with Dan Purcell taking second just ahead of Lee Noble, Tom Kelly and Tom Hogan. Many thanks to Damian for the planning and organising; Janine, Dave, Adam and Bruce for the lap scoring and Lee for collecting the arrows. A large and enthusiastic bunch of cyclists fronted up for the first race of the Mansfield Mt Buller cycling club's summer season last Thursday. The field were happy to see that the imposing trio of Kian Lerch-MacKinnon, Josh Hopwood and Dan Purcell made up A-grade leaving Bruce Halket, Jock Brega, Darren Bakker, Jarrod Appleton, Aaron Peterson, Rob Skinner, Anthony Plummer, Dave Moore, Andrew Stephenson, Nathan Pelling and Chris Taylor to form a much more even B-grade. A-grade headed off quickly at 6pm along the Barwite Loop course followed by B-grade shortly thereafter. A-grade surprisingly stayed together up the hill and continued their hard work throughout the race. At the end, Dan was able to hold Josh's wheel and move out to take a good win with Kian second and Josh third. The heat was on in B-grade as well, as Nathan and others succumbed to the Coombsberg early on. With plenty of race knowledge and fitness obtained from a long season of ski instructing, Bruce took the win over Anthony and Darren with Andrew and Jarrod not far behind. C-grade was an even larger bunch but headed off at a civilised pace that didn't change even after the neutral zone ended thanks to Mel Green and Tim Hall keeping things restrained at the front. Even the climb up the Coombsberg was rather ‘unracelike’ until Allan Gerrans made a move half way up. The bunch reacted and Steve Curnow overreacted heading boldly off the front. New member, Richard Plumb decided that there'd been enough sedate racing and made a solid lead down the hill. The uphill got the better of David Bock, David Jagger and Gerrans leaving Janine Appleton, John Eisner, Kody Appleton and Jody Batchelor to join the rest in a faster moving bunch. Taking a leaf out of the ‘sitting-at-the-front-and-doing-massive-turns’ manual, co-authored by Tim Hall and Tim Ross, Richard Plumb sat out the front and did a massive turn into the wind down most of the Barwite Road. After a bit of jostling at the turn he also led a solid run back into town before John, Steve and Kody led a bit of an attack at possums which got a bit confused and resulted in Tim Hall performing a trademark leadout back into town. At the final bend he took a good line round the tricky corner leaving everyone else scrapping. Out of the mess though John was able to ride around Jodie after some oncoming traffic and sprint to the uphill finish to take the win. Jodie hung in for second with Mel third. 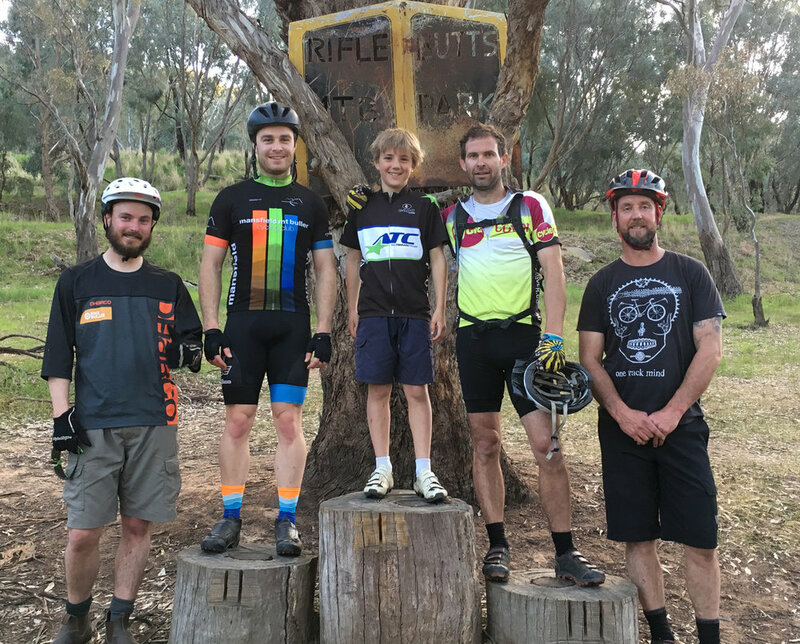 Kody edged out mum, Janine, for fourth and a special mention to the youngest Appleton, Talia, who came in not so long after the bunch in a gutsy solo effort. Presentations and a good dinner followed at the Delatite Hotel. A big thanks to our army of officials and marshals - it wouldn't work without your help. Jodie and David from Cycling-Inform have six places at their November Boot Camp they’d like to offer to MMBCC members. They’ll be waving the boot camp fee (normally $697). Camp dates are 17-21 Nov. The only condition is you must book in and stay at the Bright Chalet at $110 a night for the four nights of the camp, which includes ALL meals. That’s a bargain! For more details, visit the website or email David or Jodie. Starting at the clubrooms, racing through Glenrowan, Thoona, Ryans and finishing in Warby Range Rd. Starting in Moyhu, racing through Greta South and Myrhee and finishing in Boggy Creek Rd. It's back to Friday night - what a great way to start the weekend. Warmup from about 6pm, racing from 7pm. Everyone is welcome - seniors and juniors. Three race series in December, at the Wangaratta Showgrounds. Monday evenings, 4/12, 11/12, 18/12. The Seight Sports online store for MMBCC kit is open for one more week, till Sunday 22 October. Here’s the link you need for the Seight site, order your kit, pay with your own card and get it delivered straight to your door. Just email Bruce for the password to get access.